To get to the trailhead travel north from Paonia on the Stevens Gulch Road. The trailhead will come up on the right shortly after entering Hubbard Park right at 18 miles from Highway 133. As the trail starts out it cuts across the open meadows heading toward Hubbard Creek. Upon reaching the creek the trail crosses it and comes out onto the Mule Park Road #708 which it follows briefly before taking off on its own again. At this point the Terror trail is making use of an old jeep road that looks like a singletrack in some places and a double track in others. 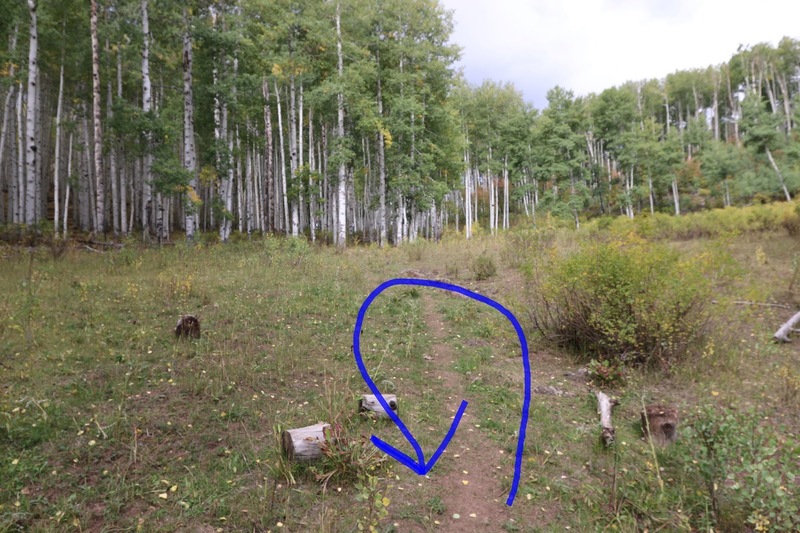 Near the 1.5 mile point the trail passes through a gate where across the draw on the right a cabin catches your attention. As the trail progresses it spends more and more of its time secluded within the trees. At the 1.8 mile point the Terror trail turns away from Hubbard Creek as that trail continues down the canyon. The trail becomes a little less distinct as it climbs away from Hubbard Creek but at this point it is still easy to follow. At the 2.6 mile point the trail that we were following split with both forks showing signs of cut logs and recent use. We followed the left fork first until it came to an end at a stock pond. After retracing our steps back to this spot we followed the right fork which also eventually ended at a watering hole. 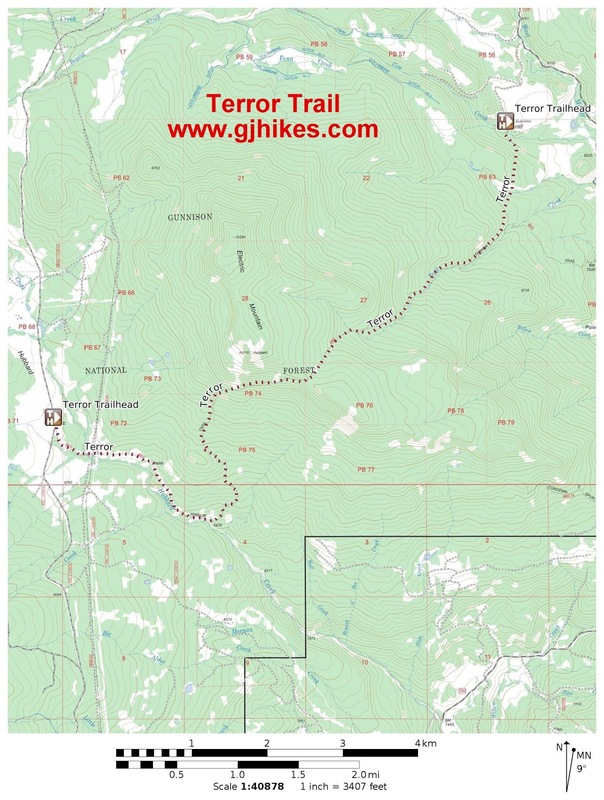 The actual Terror trail should have been more of a middle fork. The problem at this point is that they run a lot of sheep in this area and the sheep have beaten well worn paths to their watering holes. If we would have taken the time to create a GPX file by tracing the route before hand we may have been able to pick up the correct route and continued. 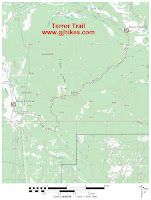 The biggest reason that we wanted to hike the Terror trail was because we liked the name. We always want to hike any trail that we see on a map or hear about from someone else but this trails name kinda moved it up the list above the other candidates. The trail was a very pleasant hike all the way up to the point where we lost it and that was even with a light rain falling at times. The trail is also open to mountain bikes. Most of what we did would have been nice to ride other than a couple of rocky sections. If you would like to see it for yourself then all you have to do is 'Take a hike'.